UNFORTUNATELY DUE TO ISSUES BEYOND THE WRITERS CONTROL THE EVENT WAS CANCELLED. THIS WAS PARTLY DUE TO INADEQUATE ADVANCE ENTRIES. THIS WAS ANNOUNCED ON THE SINGLETRACK WEB SITE AND ON THE ASSOCIATED FACEBOOK PAGE .WE APOLOGISE FOR THIS AND HOPE WE CAN PUT THE EVENT ON NEXT YEAR 2010 HAS BEEN A HARD YEAR FOR MANY ESTABLISHED EVENTS WITH MANY HAVING TO RISK RUNNING AT A LOSS SOMETHING WE WERE UNABLE TO DO. 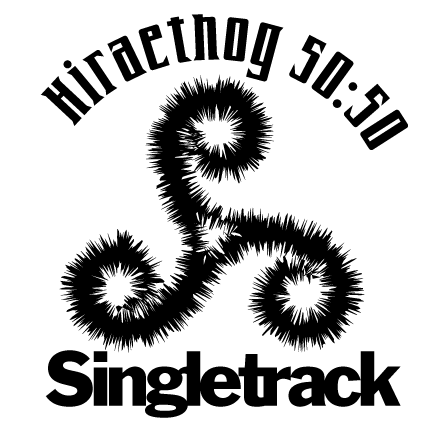 Hiraethog 50:50 is a new event to Wales and is not yet another marathon / enduro following the style of a 100 others. The event team is led by Pat Adams who has always been one of Wale's secret MTB assets and is fully supported by the landowners Welsh Water, Foresty Commission Wales and the North Wales Mountain BIke Association.